I received my review copy of Confederate Waterloo: The Battle of Five Forks, April 1, 1865, and the Controversy that Brought Down a General yesterday. I was so interested in this one I managed to read the first 100 or so pages immediately after opening the package. This “part one” of what is essentially a two part book covers the Battle of Five Forks and the smaller fights which led up to it, including the Battle of Lewis Farm on March 29 and the Battles of White Oak Road and Dinwiddie Court House on March 31, 1865. The battle portion of the book is crisp and well written. I don’t think it is quite long enough to be called a “definitive” version of the fighting at Five Forks, but McCarthy takes pains to clearly articulate what Warren’s Fifth Corps, Army of the Potomac was doing from March 29-April 1, 1865, with an eye I’m sure to the second part of the book. He shines when describing the very confused and confusing night of March 31-April 1, 1865. The author lays out the odd command setup with Grant directly corresponding with Sheridan and Meade directly corresponding with Warren, along with questionable correspondence between Meade and Grant. Throw in a poorly working telegraph system and the recipe for confusion was in place. Having attempted to make sense of these communications and place them in their proper order myself during the Siege of Petersburg Sesquicentennial, I appreciate the excellent job McCarthy did explaining events here. I was avidly scanning the notes while reading. It seems McCarthy places an emphasis on sources from the notes of General Warren, collected by the General after Sheridan sacked him in an effort to get eyewitness testimony of his actions at Five Forks. I don’t believe this is necessarily a bad thing, but it caught my eye nonetheless. I would have loved to see the author flesh out this portion of the book and make it somewhat longer, but the overall thrust of the book is not necessarily the battle itself, so the length is understandable. For those of you who prefer not to get bogged down into too much detail, it should be just right. The author needed to go into enough detail for readers to understand the later portion on the Warren Court of Inquiry, and he seems to have struck a nice balance. Before discussing a bit of the general gist of the author’s argument I’d like to take a moment to single out the maps. They are very well done by veteran Civil War mapmaker George Skoch. One minor quibble is the lack of a map on the early portion of the Battle of White Oak Road, but that’s not even remotely a deal breaker. As always, a Savas Beatie book comes equipped with enough maps to allow readers to understand the action in detail. There are maps of the Battle of Lewis Farm (Mar. 29), the Battle of White Oak Road (Mar. 31), the Battle of Dinwiddie Court House (Mar. 31), and of course the April 1 Battle of Five Forks. The other minor quibble is the lack of a map which shows the entire situation from Hatcher’s Run to Five Forks and from Dinwiddie Court House to the Southside Railroad. 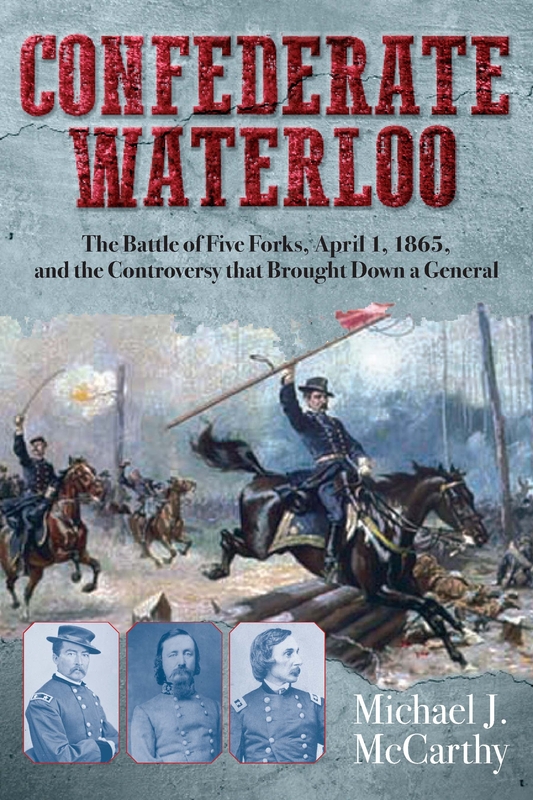 If you read the publisher’s blurb, you’ll quickly realize the author is sympathetic to Fifth Corps commander Gouverneur Warren, who was sacked unceremoniously by Phil Sheridan AFTER a successful Battle of Five Forks, a battle in which Warren played a major role. This is going to put McCarthy squarely in the crosshairs of Grant and Sheridan sycophants, so I’m assuming there will be controversy surrounding this one from somewhere. Publisher Ted Savas has never shied away from publishing controversial books if they are backed with solid research. See Dennis Rasbach’s recent book on Chamberlain at Petersburg for one such example. In this case, you’ll have those who believe Sheridan was justified in his relief of Warren after Five Forks, and you’ll have those, like me and the author, who believe Warren did not deserve what happened to him. Jim Epperson and I set up a mock debate (see PART ONE and PART TWO) over this very topic a few years back, and I thought we did a fairly good job of laying out the arguments on both sides. But I digress. All of this leads me to the as yet unread portion of the book, the Warren Court of Inquiry, in which Warren attempted to have his name officially cleared by his peers. This was made rather difficult with Grant as President and Sheridan as the second highest ranking officer in the U. S. Army. More on that to come, and stay tuned for a full review after I get back from a vacation with family.